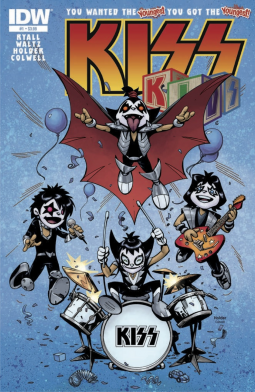 Kiss Kids is a graphic novel of short stories from IDW Publishing that brings our favorite Kiss characters “Lil Demon,” “Starchild,” “Spacey” and “Catkid” to life as kids dealing with all the issues kids go through in a funny, silly way. Most of the stories are based on Kiss song titles and there are plenty of Kisstory in-jokes to be found including everything from why they haven’t been inducted to the Rock N’ Roll Hall of Fame, Christine Sixteen as a Lil Demon’s babysitter to clothes shopping with a “Dressed to Kill” album cover reference. The way this is presented is very reminiscent of “Calvin and Hobbes” and it works. Any die hard Kiss fan will get all the references and kids will think these shorts are funny and probably read them over and over again. There isn’t a story here so don’t expect that, just shorts, sometimes only one page long of Kiss references that any Kiss Army fan should add to their collection. If you love Kiss, then this is for you!